"And at the ninth hour Jesus cried with a loud voice, saying, 'Eloi, Eloi, lama sabachthani?' which is, being interpreted is, 'My God, my God, why hast thou forsaken me?' . 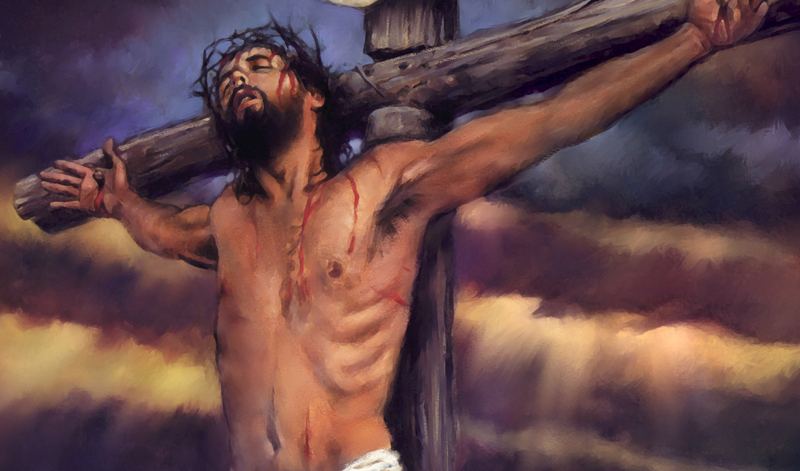 . . And Jesus cried with a loud voice, and gave up the ghost." The last words of Christ dying on the cross are disturbing to many. They look and say, "See? Even Jesus despaired in that great hour," or "See? Even Jesus felt like God had abandoned Him." No doubt, the travail of the crucifixion would be enough to break even the best of us, however, there is a more likely, and I daresay, a more encouraging understanding on these pained words. Back in first century Jewish culture, and even in some communities in the present day, it was the standard practice of all children to memorize Scripture, that is, the Old Testament. Scribes and scrolls were scarce in those days - not everyone had more books than they know what to do with. Instead, these things were memorized and rehearsed orally. As a result, even the commoner had certain passages memorized, even if without understanding. The Rabbis, particularly the Pharisees, who crucified Jesus, had practically the entirety of Scripture committed to memory. So, why is all of this relevant? It just so happens that the words Jesus gasped are the exact, word for word, verbatim, first verse of PSALM 22. Psalm 22 is a song of David which happens to contain several Prophecies of Messiah that were being fulfilled EXACTLY AT THAT MOMENT that Christ uttered it. So, more than likely, Jesus was engaging a pneumatic device, or a "memory helper" to jog the memory of the hearers, so they might realize the implications of the events they were witnessing. For example, if I said "A B C D," the hearer would almost involuntarily follow in their mind with "E F G", and so on. If I started with "Twinkle, Twinkle, Little Star," you might find your mind finishing it with "How I Wonder What You Are." Such is the way with things that are committed to memory in a deep, instinctual way. And such was the way with Psalm 22. I believe Christ had hopes they might hear, see what is going on, and BELIEVE, as they saw it right in front of them. 1. "But I am a worm, and no man; a reproach of men, and despised of the people. All they that see me laugh me to scorn: they shoot out the lip, they shake the head, saying, He trusted on the LORD that he would deliver him: let him deliver him, seeing he delighted in him." v. 6-8. 2. "But thou art he that took me out of the womb: thou didst make me hope when I was upon my mother's breasts. I was cast upon thee from the womb: thou art my God from my mother's belly. v.9-10. These verses demonstrate the "Sonship" of Christ, the closeness of relation to God, and may even imply the Incarnation, which is shown so clearly in other prophetic verses. 3. "The assembly of the wicked have enclosed me: they pierced my hands and my feet." At the very time Christ was pierced and hung on the cross, He drew their attention to the prophecy about it. Even more remarkable, this proclamation by David describing the nature of crucifixion was made a full 800 years before the Roman Empire even invented it. 4. "They divide My garments among them and cast lots for My clothing." These last verses show the conclusion of the matter. Because of this momentous event of the crucifixion, those who humble themselves before the Lord shall be satisfied and live forever. All nations shall hear of it, and it will be spoken of from generation to generation, to people not yet born, the Lord has done this thing. In this one Psalm, Jesus manages to communicate the summary of the Gospel, and bring tremendous attention to what was occurring that day. In light of the fact that Jesus said these words, which happen to be exactly verse 1 of Psalm 22, which happens to communicate things that were occurring in that very moment, it seems to me that this was no mere accident, or expression of sorrow. I have heard entire doctrines built around how God had to depart from Him because the sin of the world was on His shoulders at that time, and since God cannot bear sin, He was left to suffer alone. It may sound theologically interesting, but to me, I find this explanation not only more plausible, but far more inspiring as well. "With five loaves at the same time, and with two fishes, He will satisfy five thousand men in the wilderness . . . He will walk on the waves. He will release men from disease. He will raise the dead and drive away many pains. And from the bread of one pouch, there will be the satisfying of men." "He will afterwards come into the hands of the unjust and the faithless, and they will inflict blows with impure hands on God." "Do you not tremble, nor fear God most High? There is only one uncreated God, who reigns alone, all-powerful, very great, from whom nothing is hid." "But there is one God of pre-eminent power, who made the heaven, the sun, the moon, the fruitful earth, and the waves of the sea . . . Worship Him who alone is ruler of the world, who alone was, and is from age to age." 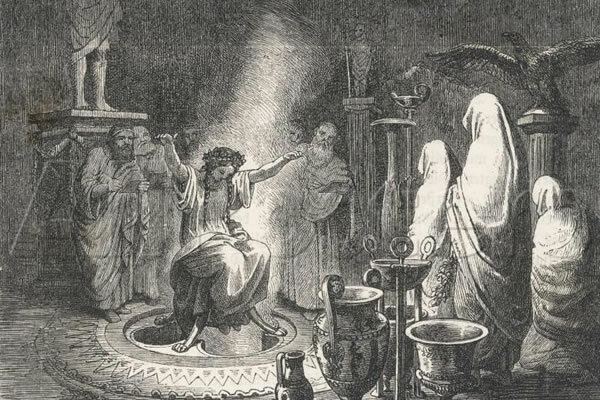 In the ancient days of Rome, Greece and Babylon, the land was filled with raving, frenzied prophetesses. Each god had their possession, and spoke to mankind, informing and deceiving by devilish influence. Yet among these, there was a class of elderly women called the Sibyls, who for hundreds of years, interlaced with their infernal madness, also proclaimed profound truths and clear prophecies of the coming Christ and a plain monotheism that stood against the pagan backdrop of a multitude of deities. Their words are very ancient, pre-dating the advent of Christ by many hundreds of years. Early Christians took note, and some were even called "believers in the Sibyls" because they so often used their utterances to evangelize to the idolatrous world around them. Legends say one of the earliest Sibyls was even a pagan daughter-in-law of Noah, explaining the synergies of both plain monotheism and messianic fervor that were uncharacteristic in pagan cultures. Modern scholars are so confounded by the accuracy of these words, they presume they were later additions to the texts, a corruption of the original ravings. "Being refuted by these testimonies, some are accustomed to fall back on the claim that these poems were not written by the Sibyls, but were invented and composed by our own writers instead. However, he who has read Cicero, Varro, and other ancient writers will assuredly not think this. For they make mention of the Erythraean and the other Sibyl, from whose books we bring forth these examples. And those authors died before the birth of Christ according to the flesh. However, I do not doubt that in former times, these poems were regarded as ravings. For, at that time, no one understood them . . . Therefore, they were neglected for many ages. But they received attention after the birth and passion of Christ." Wikipedia cites Church Father Athenagoras of Athens who, in a letter addressed to Marcus Aurelius in ca. AD 176, quoted verbatim a section of the Oracles. They are mentioned in the midst of a lengthy series of other classical and pagan references such as Homer and Hesiod, stating several times that all these works should already be familiar to the Roman Emperor. Copies of the actual Sibylline Books (as reconstituted in 76 BC) were still in the Roman Temple at this time. How then were these prophecies were forged by Christians, who at that time were small in number and politically powerless? How were they able to make the forged copies so numerous that philosophers and emperors would be familiar with their corruptions without question? How is it that their forgeries were made on the legendary level of Homer and Hesiod in so short a time, in just a mere generation? It seems that those who wish to discredit these prophecies are doing just what was attempted to be done with the piercing Biblical prophecies of Isaiah. Scholars said, "These statements are simply too accurate to be legitimate. These prophecies of Messiah are not mere interpolations of vague imagery. They must be written after the fact." Such was the running argument for generations of skeptics, that is, until the Dead Sea Scrolls unveiled full copies of Isaiah that were written before the advent of Christ, proving the prophetic Spirit alive. In the Bible, we have precedent for this strange occurrence, of pagan prophets speaking the truth of God. We have the story of Balaam, son of Beor, a non-Israelite seer often maligned in the Scriptures as an example of what a prophet ought not to be. His story shows him to be a man of selfish ambition, prophesying for money, gain, and favor. The basis of his story is that he is hired by Balak, King of Midian to prophecy against Israel. He did what the Lord asked of him, but only because he had no other choice. Outside of the Bible though, we find he was also a man of double allegiances Preserved in the Deir Alla Inscription in modern day Jordan, we find a fragment from "The Book of Balaam, son of Beor," which is a prophecy of wrath and apocolypse given by other gods, Baal and Asherah. The fact is this: Balaam was a man who the Lord God used to prophesy what was needful. Seers, mediums and soothsayers are always open to spiritual forces, but indiscriminately, without guard, barrier or discernment. This reality is often taken advantage of by devils and deceptive spirits to convey their agendas. However, since there is no guard upon them, the Spirit of God has, at times, used such persons. The implications can be haunting and confusing. It can bring up questions like, "If they were right about this, what else were they right about?" The fact is, Truth is true, no matter where it is found. Any truth is measured against the Scripture's testimony. Truth is never made untrue because of it's source. Even a fool may utter a wise word. It is only untrue being contrary to the the Inspired Word. We would be wise to admit this. Yet the early Christians so embraced these utterances, and believed that God had planted seeds of truth in the Greek and Roman cultures through the Sibyls. [Addressed to Pagans:] "You may in part easily learn right religion from the ancient Sibyl. For, by some kind of powerful inspiration, she teaches you. Through her oracular predictions, she teaches truths that seem similar to the prophets." - Justin Martyr, 160 A.D. It would seem these sorts of events, both Balaam, and the Sibyls, are a demonstration of God's great love for people. In Balaam, he was used to bring blessing upon Israel when a curse was desired. In the Sibyls, God used those who were seen as having divine authority to gave the Gentiles a foretelling of His saving plan in Christ. He would not leave people in utter darkness. His love extended even to those who heed the words of devils. The Jews were keepers of the untarnished prophecy, held and preserved for all time that every generation might see their fulfillment. But the Sibyls spoke to a completely contrary, unbelieving world - God taking advantage of their authority, as well as their indiscriminate spiritualism, to bring light where none was to be found. The result was a stark contrast between the Messianic prophetic verses and the devilish rantings. The result was countless souls converted from paganism to Christ by the rightful use of their testimony. The result was showing a demonstration of the powerful love of God to go to any length to reach so very many.